Fresh chilies and sweet spices. Real Thai, real easy. 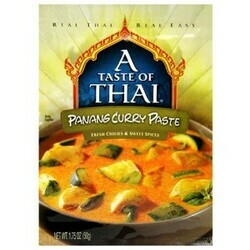 Authentic Thai Taste: Our curry pastes make it easy to create you favorite Thai restaurant dishes. Just mix with coconut milk for a classic curry sauce for meat, fish and vegetables. Or give everyday meals as exciting taste of Thailand--try mixing a teaspoon of curry paste into hamburger, soup and stews. Preservatives free. MSG free. Gluten free. Produced in Thailand.